Sun is made of ceramic and kiln fired at extremely high temperatures to withstand the outdoor as well as the indoor weather. The luminating glow from this rabbit will show through her polka dots when you place a candle under her. The color of the flower may vary. Rabbit is made of ceramic and kiln fired at extremely high temperatures so that it will withstand the outdoor as well as the indoor weather. 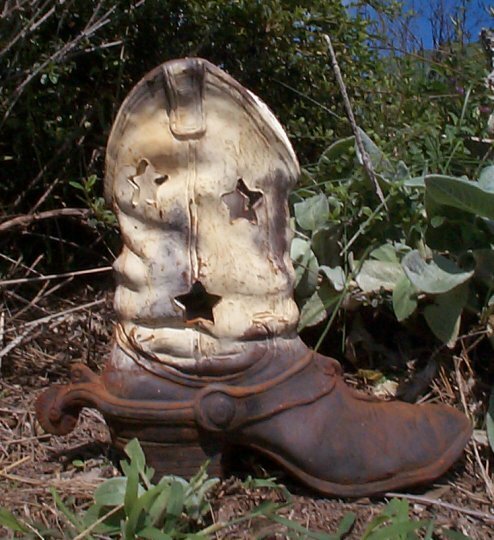 Plant some flowers in these boots or just use them for a place to store your garden tools or seed packets. Rain Boots are made of ceramic and kiln fired at extremely high temperatures so that they will withstand the outdoor as well as the indoor weather. 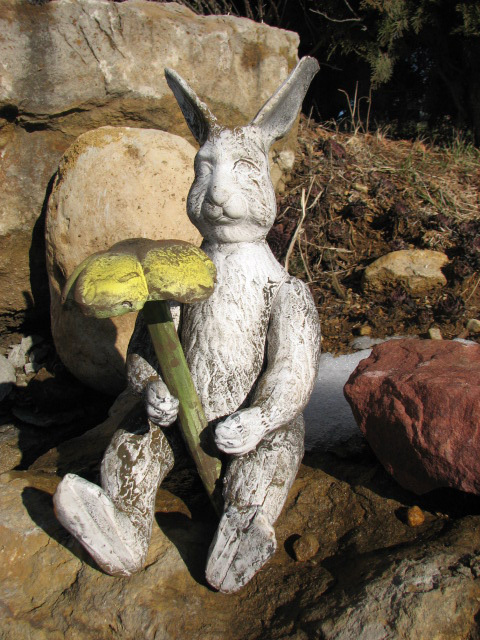 This jointed rabbit will sit great in your garden holding one of our flower stakes. 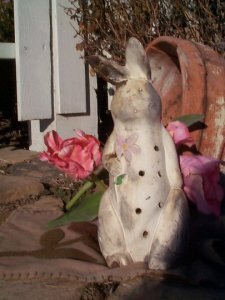 Rabbit is reproduced from an antique stuffed rabbit. Flower stake sold separately. 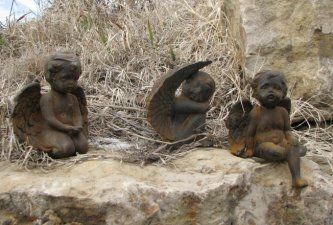 Tuck these little birds in planters or birdbaths or anywhere you little heart desires. 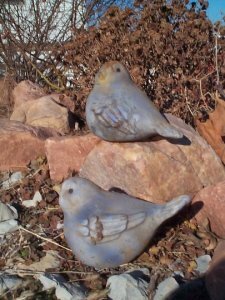 Bluebirds are made of ceramic and kiln fired at extremely high temperatures so that they will withstand the outdoor as well as the indoor weather. Birds are sold in a set of two. The spurs on our cowboy boot won't jingle or jangle but it will hold a small votive candle or a plant. Let the stars shine bright through out candle cutouts or stick moss in them for a planter. It does great with Hens & Chicks! 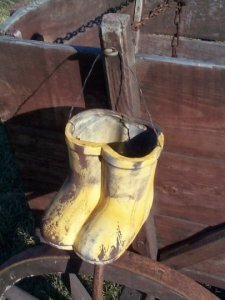 Boot is made of ceramic and kiln fired at extremely high temperatures so that it will withstand the outdoor as well as the indoor weather. 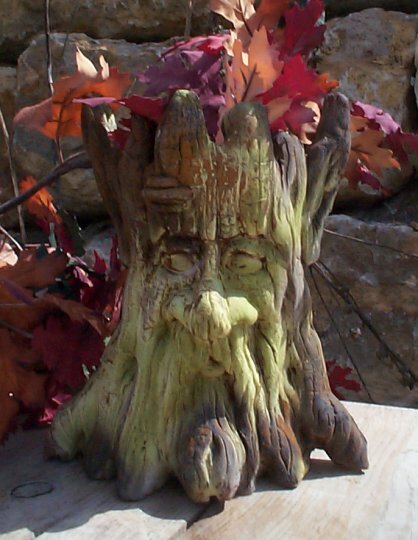 This large green man tree trunk planter looks great with mums or fall foliage. 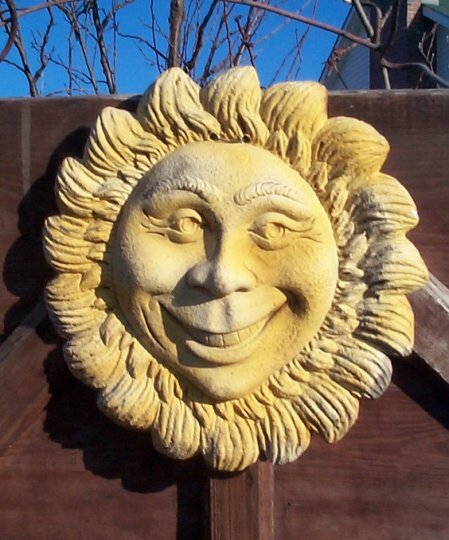 Then nest him in your garden among the pumpkins. Tree trunk is made of ceramic and kiln fired at extremely high temperatures so that it will withstand the outdoor as well as the indoor weather. This large cherub will look great sitting in your bird bath. 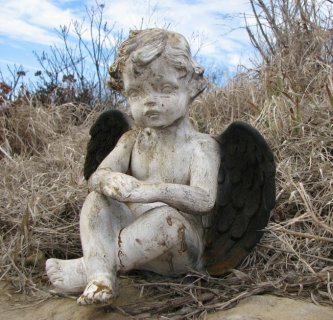 Cherub is made of ceramic and kiln fired at extremely high temperatures so that it will withstand the outdoor as well as the indoor weather. 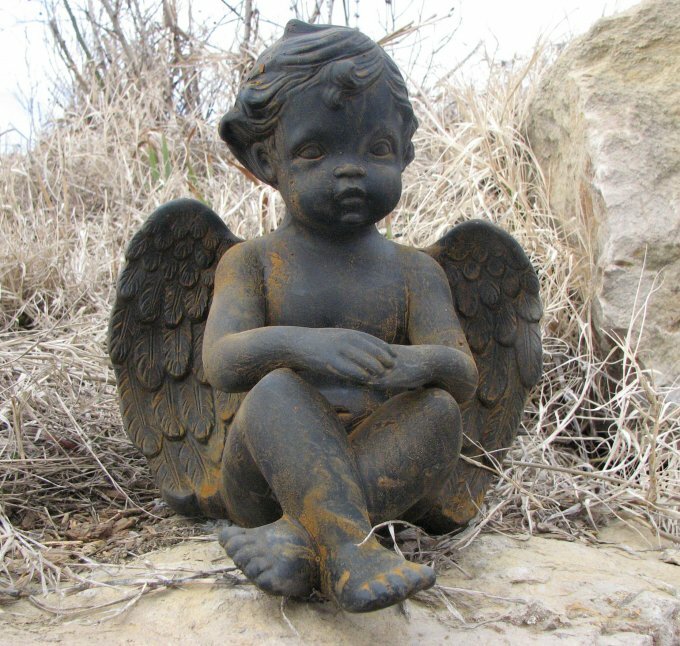 This little cherub will look great sitting in your bird bath. Styles will vary but please make your request below. If we cannot fulfill it, we will let you know what options are available. 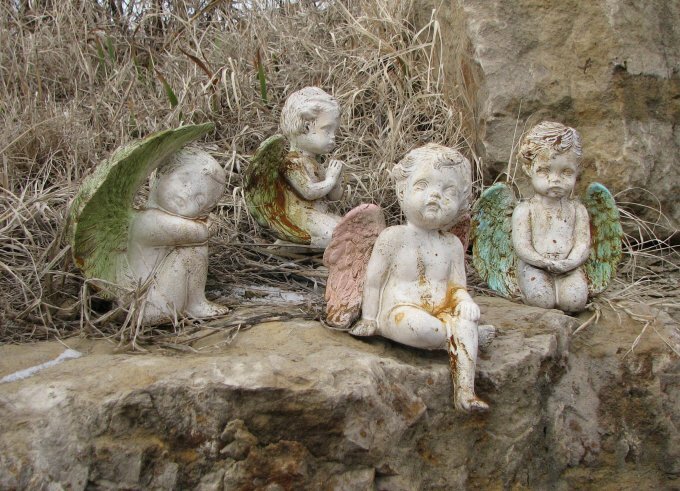 Cherubs are made of ceramic and kiln fired at extremely high temperatures so that it will withstand the outdoor as well as the indoor weather. This little cherub will look great sitting in your bird bath. Styles and colors will vary but please make your request below. If we cannot fulfill it, we will let you know what options are available. 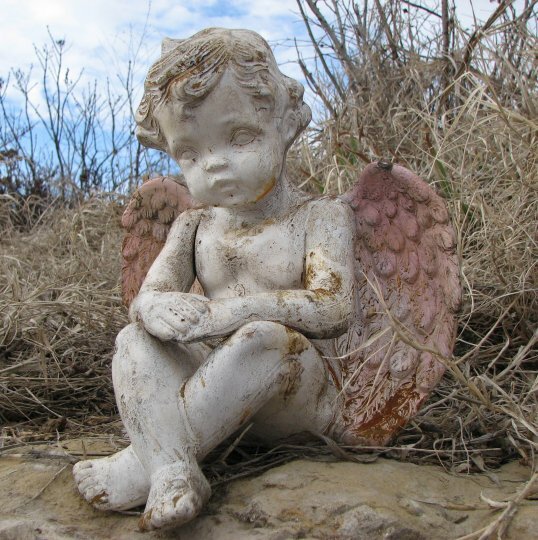 Cherubs are made of ceramic and kiln fired at extremely high temperatures so that it will withstand the outdoor as well as the indoor weather. 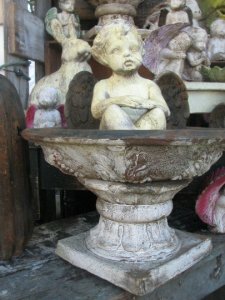 This birdbath looks great when you place one of our large cherubs or several small cherubs in the bowl. Birdbath comes in two pieces (bowl & pedestal). Birdbath is kiln fired and extremely high temperature so that it will withstand the indoor as well as the outdoor weather.